It's been a while since I posted! I've been so busy with school starting back up, soccer, and preparing for all the upcoming holidays. In the middle of all that craziness, I've been working on something really fun. A full pantry re-do! 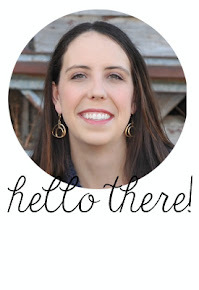 You'll have to wait until November 1st to see the full reveal-when I guest post over at GingerSnap Crafts. For now, here is one of the many projects I tackled to get our horrid pantry in pristine condition. The solution I finally came up with was wood crates that roll! I didn't want our wood floors to get scratched up by them, so wheels were a must. I ordered some wood crates from Home Depot. I know Michael's and Joann's carry them too sometimes. At first, I thought I would stain all of them. I loved this weathered gray stain. But staining was a total pain! I'm a FAST DIY kind of girl. I was DONE with staining. I had no idea it was so messy, or time consuming. Out came my trusty spray paint for the other two. After spray painting and staining were done, it was time for the easy part. Adding wheels! I bought these wheels that roll AND swivel (fancy!) from Lowe's. Each wheel took four screws. Save yourself some time and use a drill! 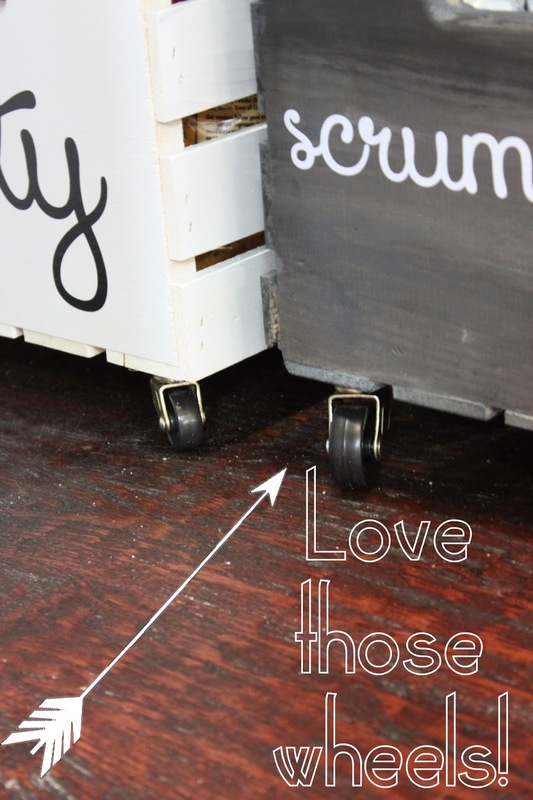 The wheels are cute, and make it so much easier to pull the crates in and out of the pantry! Add a little vinyl, and done! Oh these are just perfect for storage! Love that you added the wheels! those are really neat! now to come up w/ a place I could use em at my place!!?? coming at you from Funky Junk Interiors Linky Party! LOVE LOVE LOVE!! I'm sorry if I missed it, but how did you apply the tasty, scrumptious, and yummy words? Did you mean they were adhesive vinyl? I love the font! Amy, I just used a friend's Silhouette Cameo to cut out the vinyl, and then apply it. Hope that helps! What a neat way to organize things. I'll have to add this to my list of things to do! Great idea, especially it is rolling!! Thank you for sharing at our TGIF Link Party at A Peek Into My Paradise! Congratulations! Your post will be featured at the TGIF Link Party this week and will be pinned to the TGIF Party Board! I can't wait to see what you link up this week! Cathy, thanks so much for the feature! Love this idea-i buy crates from an apple orchard down the road -already weathered stained-lol. But the crisp white crates look great holding food. Sarah what size and font was used for the vinyl words? I truly enjoy and appreciate EVERY comment! Thank you for taking the time to comment, and stop by my blog! Peeps who read my blog! The ideas, projects, and tutorials on this blog are copyrighted! You are free to use them for PERSONAL, home use. Not for profit!